Salted fish achar is a type of spicy pickles which is cooked in a spicy dry sauce. It can last for almost a month if kept in a jar in the refrigerator. alted fish is a very common ingredient in Malay cooking. Used to be regarded as poor people staple, ironically nowadays enjoys popularity due to "back to basic" awareness in Malay cuisine. It is versatile, can be simply deep fried or added in curry, with coconut cream sauce and other gravy. The recipe on this page is a popular side dish in northern states namely Perlis, Kedah and Penang in Malaysia. Cheap to make but gives such a boost of flavour to your steaming rice. 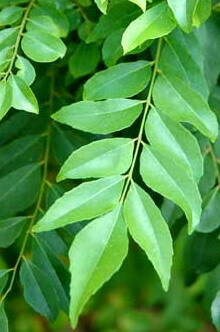 The addition of whole curry leaves make it special. Mind you, curry leaves have several species by itself, I was told that these herbs with reddish stalks smell nicer than the rest. Process cumin, garlic and dried chillies till smooth.